Noel Johnson, the 53rd ranked player in the country in the Class of 2009 by recruiting service Rivals.com, is concluding a two-day visit with the Charlotte 49ers on Tuesday. Johnson, a 6-foot-7, 180-wing player from Fayetteville, Ga., is also the 11th ranked small forward in the country and a four-star recruit. 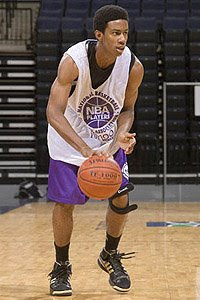 He originally signed with Southern Cal but was recently granted a release from his letter of intent. Johnson is considering several schools, including Georgia Tech, Louisiana State and UNLV, although Charlotte is considered the front runner, sources said. It is unclear how Johnson would be able to receive a scholarship. As of Tuesday, all of the 49ers' scholarships are taken for the 2009-10 season. Rivals.com describes Johnson as a wing guard with good size and an excellent jumper. !&#! This just might be my year. Oh my gosh I think I might have a heart attack. Gotta make it back to the NCAA tournament, gotta make it back to the tournament. Let's go Niners!!!!!! great news. Would be a GREAT addition. His game sounds like it would be a perfect fit for Charlotte. Heard his visit went awesome. Expect news on someone giving up their schollie. I have heard he is looking hard at going to his father alma-mater - Wichita State. Almost a done deal. Yeh if he goes to Wichita State he will be anonymous. Yeah, WSU has only has 4 post-season wins versus Charlottes 1 in the last 7 years including a Sweet 16 run. 10:43---If you're actually insinuating that WSU has a better "overall" bball program than Charlotte then you're a freakin' idiot! Yeah, 2008 Charlottes 204th RPI is so impressive and the A-10 is such a great conference - not. Bringing up Charlotte's 08-09 season--its worst in 20 years--to put down the program? Way to go. I am a Charlotte alum, but bashing WSU is silly. They pay former Winthrop coach Gregg Marshall 900k per year folks. They get awesome crowds, and went to the sweet 16 not long ago. as a program, WSU can not hold a candle to Charlotte----PERIOD---regardless of what happened the last 2-3 years! Look over the last 20-30 and tell me who is better. Its not even debateable! Yeah and Gregg Marshall has done what exacty? I looked up and compared WSU vs Charlotte. WSU has had some pretty good players and have a few less appearances but have did more. How convenient you picked since 1980. What a joke. I don't care , georgia southern university eagles will win the ncaa.national championship in men's college basketball this year with their new great head coach hopefully CHALTON YOUNG. go GEORGIA SOUTHERN EAGLES !!!!!!!!!!!!!!!!! !